Whatever happened to the Etobicoke RT? Heading to the airport via Kipling station a few weeks ago, I noticed an area on the south side of the upper level opposite the bus loading area that appeared to be an empty trackbed and roughed-in platform. It was obviously nothing to do with the subway below - the bed was too narrow anyway - so what was it? It turns out the inaccessible area visible through plate glass windows from inside the station is the only piece ever built of a planned Etobicoke light rail line. 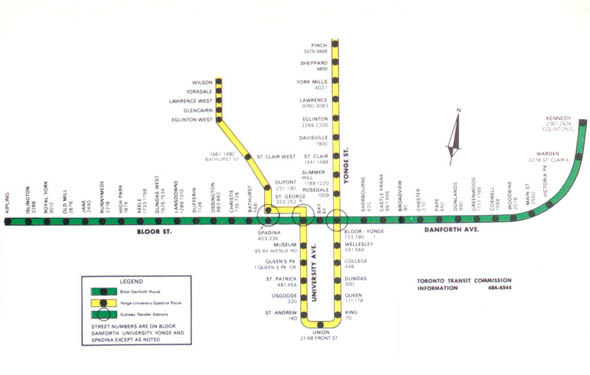 By extending the Bloor-Danforth line east to Kennedy and west to Kipling, the TTC once planned to provide connections to two LRTs that would bookend the route and serve the less dense areas beyond with lower predicted ridership. As we now know, the Scarborough RT would be the only one of the pair constructed. 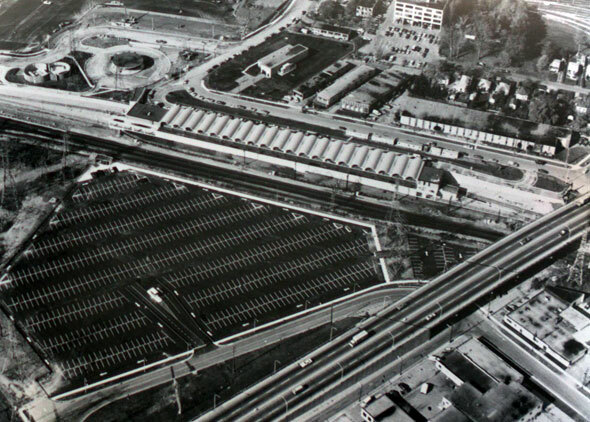 Kipling station's full potential, and perhaps raison d'etre, would be lost somewhere along the way. 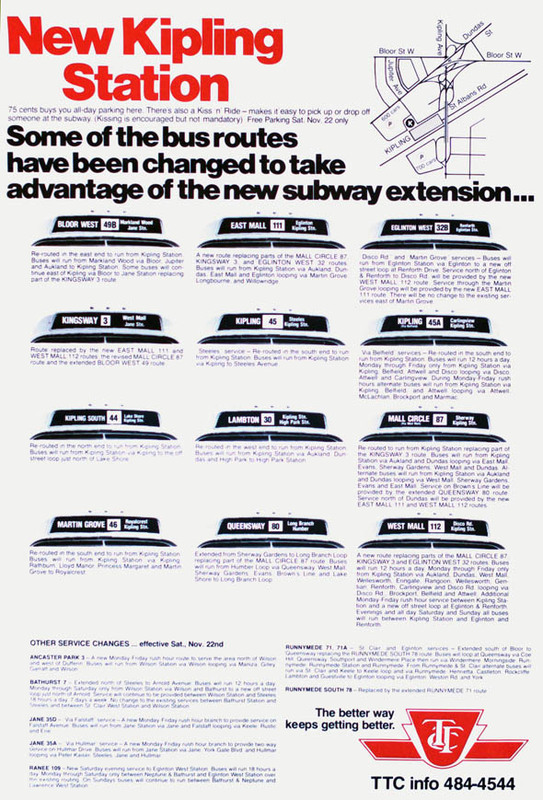 In the late 70s, the TTC began work on what would be the final extension of the Bloor-Danforth subway line. At a cost of $110 million, 75 per cent of which came from the province, one stop was added in each direction to Kipling Avenue and Kennedy Road. 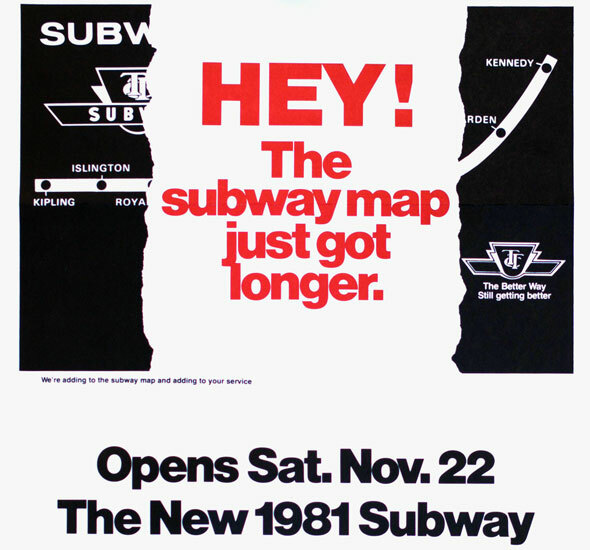 Realistically, extending the line to Kipling was never as easy to justify financially as the Kennedy extension. If you think about it, the Bloor-Danforth line could still easily terminate at Islington today and provide similar services and connections. Several local bus routes were altered to start or end at Kipling at the time. James Bow from Transit Toronto notes, adding a stop in a low density area like the middle of Kipling Avenue never really panned out for the TTC. Mississauga transit still prefers the location of Islington station for its hub and GO riders could just as easily board a subway stop earlier if the necessary infrastructure was in place.So what would a west-end LRT have looked like had it been built? According to Scott Haskill, a senior transit planner at the TTC, the Etobicoke RT would have run north on the Kipling hydro corridor to Pearson then east on the Finch corridor toward York University. 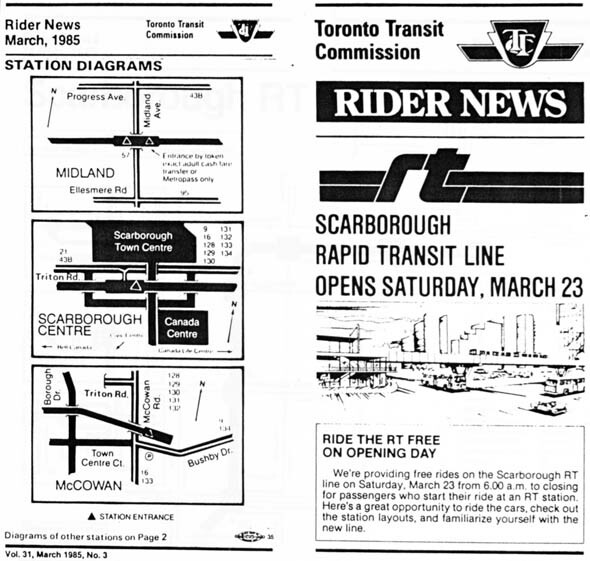 Presumably the system would have looked similar to the Scarborough RT. Local stops could have been included at Burnhamthorpe Road, Rathburn Road, Eglinton Avenue, Highway 401/427, Islington Avenue, Weston Road and Highway 400 if this had ended up becoming the final route. Interestingly, the east end RT was originally conceived to use ALRVs - the double, articulated streetcars shown in the illustration above - but the arrival of the high-tech, driverless ICTS vehicles, which were backed by the province, convinced the TTC to modify the route mid-construction. 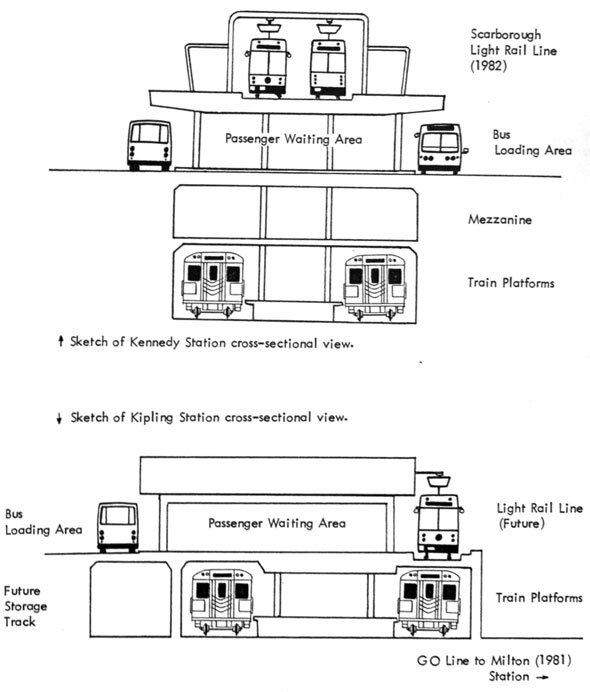 The strange single track at Kennedy, different to what is shown in the plan above, is proof of this last-minute design change. Since the province managed to get ICTS cars in Scarborough, it's therefore pretty safe to assume the vehicles would have been used in Etobicoke too. In the end, the TTC never pursued the Etobicoke RT as a viable transit line and it joined the long list of abandoned or never-developed ideas the commission probably tucks away in a dusty desk somewhere. 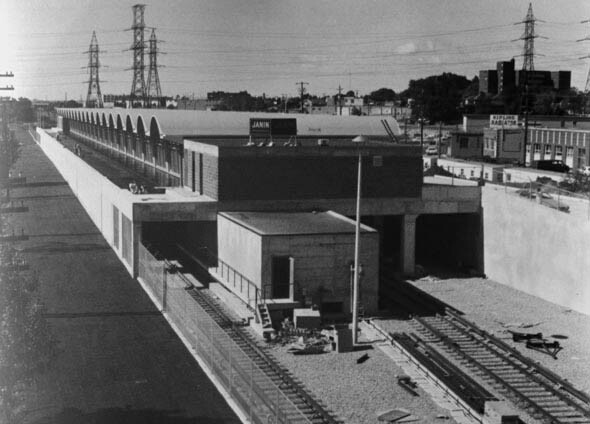 Other stations have similar "future-proofing" for services that have yet to arrive; there's an extra tunnel without track at Kipling for access to an unbuilt yard and the Sheppard and Spadina stops have knock-out panels for access for new connections, should they ever arrive. Next time you're at Kipling imagine hopping on a rapid transit vehicle instead of cramming onto the airport rocket bus. 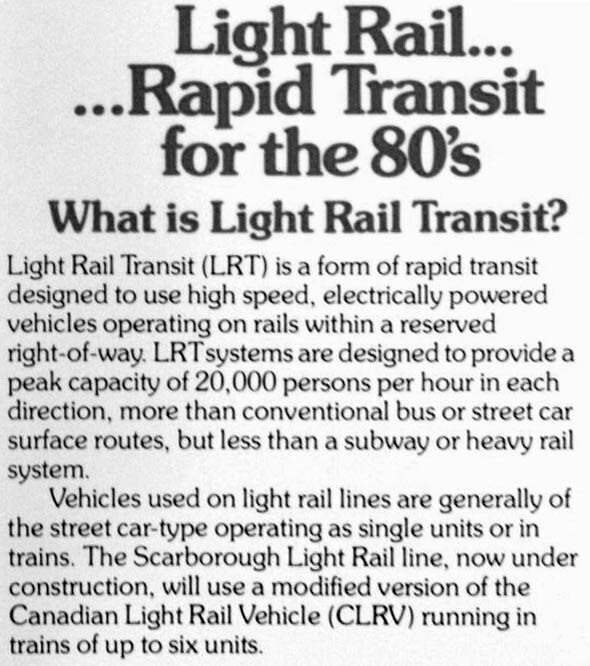 LRTs - rapid transit for the 1980s? Images: City of Toronto Archives.